AGGGGHHHHHHH!!!! 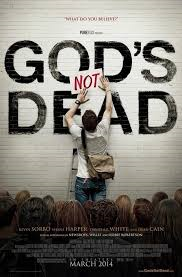 God's Not Dead is one of the best movies I have seen in a long time! This movie exceeded my expectations by far! I went to see this movie with my family and all of us just adored it! Whether you are a Christian or not I challenge you to go see this movie! It is basically a debate between a Christian freshman in college against his atheist professor, along with some side stories that are all tied nicely together at the end. I thought the freshman would say a few bible verses and that would be it but this movie brings up todays topics and really gets you thinking. See the trailer to get a glimpse at this incredibly well made movie! I know that I am a Christian but even if you aren't I challenge you to just go see it quickly before it leaves the theater. This movie features all types of real life situations that a lot of people go through good and bad. It also features Willie Robertson for a bit so if you love Duck Dynasty use that as an excuse to go check it out! If you go to see it or have gone to see it let me know your thoughts, arguments, and agreements by sending me an email! Love that movie! Wish it was in theaters longer!